Mandakini Garden is one of the residential development of Mandakini Resorts, located in Bhubaneswar. It offers spacious and skilfully designed 1BHK, 2BHK and 3BHK apartments. The project is well equipped with all the basic amenities to facilitate the needs of the residents. What is the project location?The project is located at Patia, Bhubaneswar. What is the area of apartments in Mandakini Garden? The area of apartments offered in the project ranges from 811.0 sqft to 1807.0 sqft. What is size of 1 bhk in Mandakini Garden? The area of 1 BHK apartments ranges from 811.0 sqft to 961.0 sqft. What is the area of 2 bhk in Mandakini Garden? The size of a 2BHK unit in the project ranges from 1102.0 sqft to 1465.0 sqft. 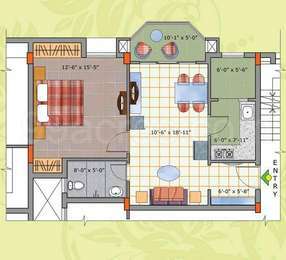 What is the 3 bedroom size in Mandakini Garden? The area of 3BHK units in the project varies from 1440.0 sqft to 1807.0 sqft. How many number of towers are there in Mandakini Garden? With 4 tower, the project offers 104 housing units. Is there any availability of 3BHK flats. Need it for ready to move. I need a 3BHK flat around Patia. Does Mandakini properties have it ? Hi Omesh, right now, a 3 BHK apartment in Mandakini Garden would cost you around Rs 72 lakh. The society is equipped with basic features like gym, club house, kids play area, swimming pool, landscape garden, shopping centre, etc. The crosscheck the availability, you may visit online property sites.